ROUGH-HEWN WHEELED CROSS ABOVE GRAVE SET ON A TAPERED SQUARE BASE BEARING INSCRIPTION. 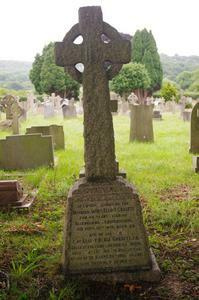 IN LOVING MEMORY OF THE / REVEREND JAMES ELLIOT GRASETT / FOR 46 YEARS VICAR OF / ALLENSHORE, HEREFORDSHIRE, / DIED SEPT. 13TH 1919, AGED 86. / AND OF HIS SON / CAPT. ELLIOT BLAIR GRASETT, I.A. / KILLED IN THE THIRD LINE GERMAN TRENCH, / GALLANTLY LEADING HIS MEN, AT THE BATTLE OF LOOS, SEPT. 25TH 1915, AGED 25. / BOTH "FAITHFUL UNTO DEATH".